A tasty bed time snack is helping prevent the loss of one of Scotland’s rarest resident breeding birds. 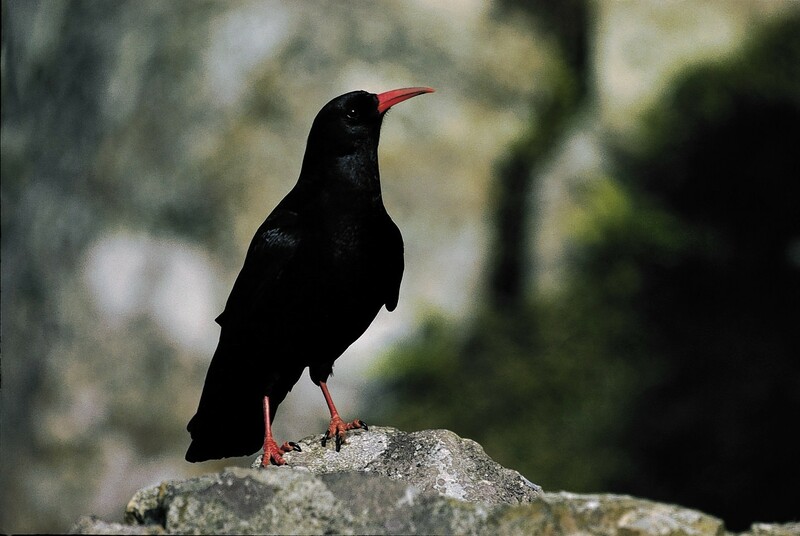 Populations of the red-billed chough, which lives on the islands of Islay and Colonsay, have been in serious decline for several years resulting in the bird being given amber conservation status by the Royal Society for the Protection of Birds (RSPB). Last year only 39 breeding pairs were counted on Islay compared to 95 breeding pairs in 1986. Conservationists from the island and Aberdeen University noticed the problem seemed to be a poor survival rate for young choughs, with few birds managing to survive the two or three year period between leaving the nest as fledglings and becoming adults. To try and help Scottish Natural Heritage (SNH) has been working with the Scottish Clough Study Group and local farmers to provide additional food for young birds. For the last three seasons the young birds have been given a nutritious mealworm snack at their pre-roost feeding areas before they go to their communal roosts for the night. Rae McKenzie, SNH policy and advice manager said: “This year we have started to see the dividends of this work. An Islay-wide census of choughs carried out in collaboration with the Scottish Chough Study Group and the RSPB, as part of a wider survey including England, Wales and the Isle of Man, counted 46 breeding pairs. This includes several new pairs of young adults which we have been feeding at the sites during the project. Long term habitat management is being encouraged through Scottish Rural Development Programme (SRDP) options designed specifically for chough habitats, and a number of Islay farmers are taking part in this scheme. Eric Bignal, of the study group said: “In the long-term, providing food in this way cannot substitute for better management of Islay’s special habitats, so that a healthy population of choughs can support itself.